of the 1940s. His legacy at Marvel Comics includes The Invaders and The Liberty Legion, and at DC he did Infinity Inc. and The All-Star Squadron. The latter was first seen in Justice League of America #193 (August, 1981) in the form of a free insert, previewing the new series. This was a promotional ploy DC used quite a few times during the early 1980s, for example when Dial H for Hero was previewed in Legion of Super Heroes #272 and He-Man was previewed for comics in DC Comics Presents #47. The promotion (as well as the series) was written by Thomas and drawn by Rich Buckler (Deathlok the Demolisher, Reagan's Raiders). It brought together several 1940s DC-owned heroes, and not just those who had been in contemporary teams, i.e., The Justice Society of America and The Seven Soldiers of Victory. President Roosevelt gathered as many as possible of America's "mystery men" (i.e., heroes with secret identities) in response to the Pearl Harbor emergency. The name of the group was a reference to All Star Comics, where the JSA's stories appeared. The All-Star Squadron moved into its own title the following month. It set up headquarters in the refurbished Perisphere (a relic of the 1939-40 New York World's Fair) and continued to fight the Axis menace with an open-ended roster. Any superhero published by DC, Quality Comics or Fawcett Publications (the latter two agglomerations having been acquired by DC later) could turn up, and most did, at least in a crowd scene or two. Among the few seen in one issue or another of All-Star Squadron were Answer Man and The Terrific Whatzit, who were intended as comedy and therefore not of interest to the male adolescents who constituted the vast majority of 1980s DC readers. Since many of these characters' personal lives hadn't been explored very thoroughly in their original incarnations, and since most current readers didn't know very much about them anyway, Thomas felt free to treat them as he pleased. For example, he took Firebrand (who had the cover spot on Quality's Police Comics before Plastic Man) out of action with a serious injury, and replaced him with his sister, also called Firebrand, giving her super powers in the bargain. (The original idea was to use Wildfire, but DC was already using a character of that name.) And he conjured up a romance between Johnny Quick (a denizen of DC's More Fun Comics) and Liberty Belle (a minor character from the back pages of Star Spangled Comics), who back in the '40s gave no sign of ever having met. He also created a few new-old superheroes for the series. Amazing-Man, named after a character published from 1939-42 by Centaur Publications (The Clock, Speed Centaur), which was long defunct and therefore unlikely to to make an issue of it, was introduced in the 23rd issue (July, 1983), giving the group its only black member. The multi-racial theme was continued ten issues later with Tsunami, who represented the Japanese-descended Nissei, then imprisoned in California concentration camps. The group also included Steel, the Indestructible Man (aka Commander Steel), who was created in 1978 by Gerry Conway (Firestorm, The Punisher), but set in the '40s. In the mid-1980s, DC's company-wide crossover series, Crisis on Infinite Earths, which was designed to make its back-story easier for new readers to understand, instead made a hash of its 1940s characters' history. 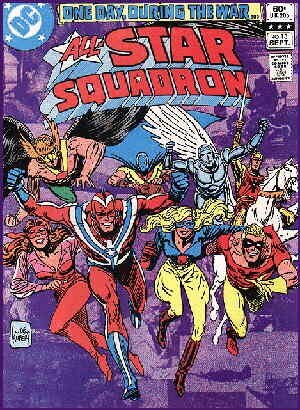 By 1987, it had become very difficult to keep things straight in a series like All-Star Squadron, and after 67 regular issues and three annuals, the last dated March of that year, it ended. Three months later, DC launched Young All-Stars, also by Thomas, to include the younger members of this group, plus revised and re-named versions of some of the members that had been retconned out of existence, augmented by frequent guest appearances of the others. This one lasted until 1989. Since then, tho the '40s characters remain a prominent part of the DC Universe back-story, the company hasn't done any prominent series that looked too closely at them. Text ©2004-10 Donald D. Markstein. Art © DC Comics.